Get a glamorous look by wearing this parrot green color floor length anarkali suit is sure to make any women look beautiful and outstanding. 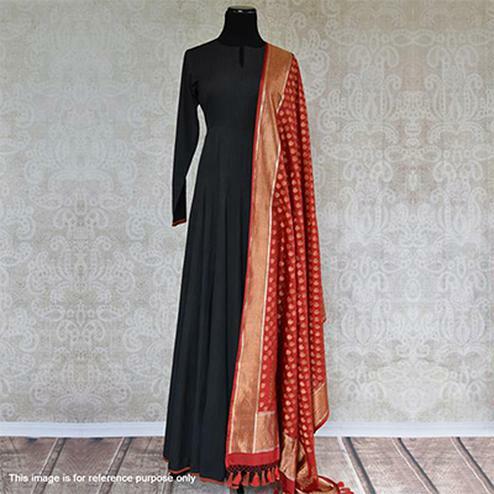 This semi stitched outfit has got georgette fabric kameez having high neck, long sleeves. Available with american crepe bottom and lining. Beige color net dupatta enriched with floral embroidered motifs. Specially designed to wear for parties, traditional functions festivals and special occasions, where you want to be center of attraction. Pair it with matching ethnic accessories to elevate your ethnic look. This attractive suit will surely fetch you compliments for your rich sense of style.